How do I Use a Cash Flow Worksheet? 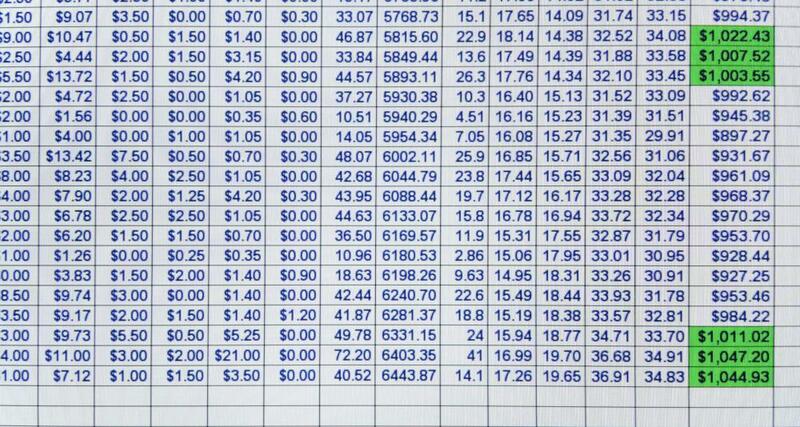 Some people use computer software to create cash flow spreadsheets. To use a cash flow worksheet, simply fill out each column with the pertinent spending information each day. Add the totals from each daily category together at the end of the week. Repeat this pattern to determine monthly or even annual cash flow estimates to better understand how spending habits can be adjusted. A cash flow worksheet is designed to allow working professionals an accurate way to track overall profits and losses within a business. Some of these worksheets can be filled out almost exactly like a checkbook registry, while others group expenses into separate categories in order to make the review process easier. Regardless of the actual type of cash flow worksheet used, it will ultimately help determine how money is being spent and ways that homeowners or businesses can reduce unnecessary costs. Over the course of several months, there will undoubtedly be a large amount of paperwork to keep up with, which is why businesses normally use a computerized cash flow worksheet. It is typically easy to design one on any type of spreadsheet application; simply place titles beside each of the columns to indicate various types of purchases and another section designed to track any incoming revenue. The entire spreadsheet can be programmed to add and subtract the columns automatically so the mathematical element is eliminated, and additional spreadsheets can be designed to pull the previous day's totals over into a new column. Although the setup process takes a little bit of time, everything is automated afterward. Of course, there are also many good samples of a cash flow worksheet that are available for download off of the Internet as well. The most important aspect of using a cash flow worksheet is to list each and every financial transaction daily so that accurate evaluations can be made at the end of the month. Also, customize the cash flow worksheet to contain as many sub-categories as possible so that expenses can be properly tracked. For example, a tab marked, "cash withdrawals" would not be very insightful since this transaction type could cover numerous items. Not only will itemizing a cash flow worksheet help spot poor spending habits, but it will also make tracking payments much easier. Besides the reasons already mentioned, many business owners also have their store managers fill out a cash flow worksheet on a daily basis to serve as a quick overview of that day's profitability. While this document would not include items like the cost of electricity or that day's percentage of the monthly mortgage cost, it is an easy way to track many aspects of the business. Several business owners use a cash flow worksheet to compare weekly sales on a certain day of the week, track inventory, and detect signs of theft from employees. How do I Create a Cash Flow Spreadsheet? How do I Choose the Best Budget Planning Worksheet? What is Cash Flow Per Share? What is a Negative Cash Flow?